Seasonal Occurrence: Common in spring and fall. Rarely lingers into winter. Profile by Glenn Olsen: As spring approaches, birders begin talking of spring migration and the arrival of the various warblers. Of the many warblers that migrate through our area, a common one that does not receive much discussion or attention is the American Redstart. 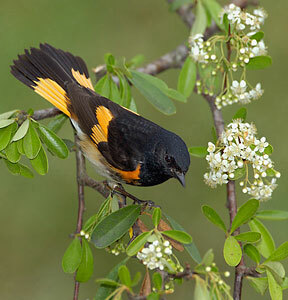 Like many of our wood warblers, the American Redstart is brightly colored, but the colors and color pattern are so distinctive that it is not easily confused with any other warbler. Perhaps that is why it does not receive much discussion. Although easily identified, this fairly common bird has rare beauty, even for a warbler. As with most birds, the adult males are the most colorful, having a black head, back, and throat contrasting with a white belly and orange (sometimes yellow) patches in the flight feathers and at the base of the tail. The females are just as beautiful though softer in contrast with a light gray head and bright yellow patches in the flight and tail feathers. The American Redstart employs several foraging techniques, one of which is quite similar to the "sallying" of flycatchers. The redstart may dart upwards to pluck an insect from mid-air and then appears to float back down on spread wings and tail; the orange patches in the wings and tail flashing like a flame. These sorties for insects can be quite acrobatic and interesting to watch as they forage, most frequently in the low to mid story canopy. Interestingly, the redstart's bill shape and well developed rictal bristles are uncommon for most warblers and is suggestive of a flycatcher. 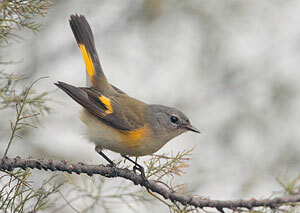 At other times the redstart will be darting from limb to limb, actively foraging, and the tail will be fanned periodically as if to show off the beautiful orange patches or perhaps to flush insects from hiding. This too is a vivid display of the beauty of this warbler. Naturally, one of the best times for us to see this species is during spring migration, when many pass through our area en route to breeding grounds in the eastern U.S., parts of north central and northwest U.S. and most of Canada. However, some birds remain to breed in East Texas. Early migrants begin arriving in our area in late March, and migration continues through about mid-May.